Let me start this off with a funny story about a time while I was in Thailand. I was traveling once from Bangkok to Koh Samui and since it was near New Year’s Eve, most of the direct flights were way too expensive or already booked, I had to take a ferry from Donsak Pier near Surat Thani in South of Thailand to the Island. Now I had never been on one of these ferrys before and I didn’t know they were these HUGE commercial transport ships that had up to 3 floors and carried 100s of people as well as cars.I dragged my 20 kg over-sized suitcase, a full to the brim backpack and a decent sized hand carry on to the ferry when I realized I had to climb stairs and sit on the 2nd level … And there was no elevator. If it hadn’t been for this super nice Japanese guy who helped me carry my bags I don’t know what I would have done.It was embarrassing enough that he had to carry my bags for me once up the stairs but he later had to carry them DOWN as well when we arrived at our destination. It was probably the funniest thing I had heard on my trip, and it was true. We Desis tend to over pack as if we want to be prepared for every contingency in the world.Maybe that’s a good thing but it certainly puts a dent on how flexible and fast you can move around during your trip , and since then I definitely think that less is more when packing a suitcase. 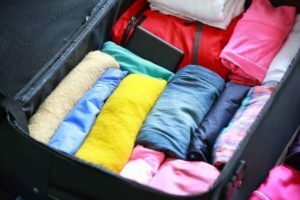 So hence I bring to you some useful packing tips which can help you minimize what you pack , travel lighter and enjoy your trip with greater ease! This is where you can do all your ‘you never know” wali thinking. Put ANYTHING you think you might want to take along with you to your trip and just dump it into your suitcase. After that leave it there for some hours and come back to reconsider what you might not need. Do you REALLY need that extra pair of pants? What could you possibly need 5 shirts for when you can buy some while you are there? Don’t you want to keep some space or shopping? Keep doing this ‘mental exercise’ and removing clothes from the suitcase until you are down to 30% of what you had originally put in. 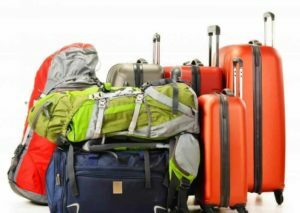 It will save a lot of space and chances are you still won’t even use half of those on your trip. 2) …Just get your laundry done on the go instead! It’s OKAY to repeat the same clothes while on a trip. You are going to explore & discover, you aren’t going to find your rishta. 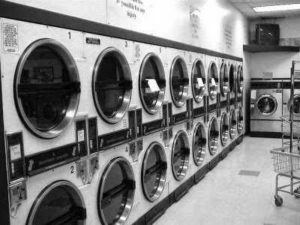 (wedding proposal) – always better to be practical.If you feel your hotel laundry services are too expensive for you,then look for a laundromat or laundry service nearby if you can. It is worth paying for to save the luggage space. This is an age told trick which most people already know. However,it always comes in useful. 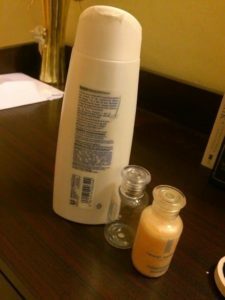 You know those small bottles of shampoo & soap that you get in hotel rooms? Don’t throw them away. Keep them. They can be very useful to re-fill with the shampoo or facewash of your choice while travelling and they are tiny enough to fit in the smallest travel bag. 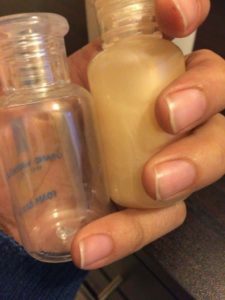 One bottle is good for up to 5 days of product at least, and even if you need to take more they are so small, it won’t take up much space. Shoes being the terrible, bulky things they are, can take up a huge amount of space. Especially if you are tiny like I am and need to have wedges or heels with most shoes. I solve this problem by never packing a pair of shoes together – They just bulk up too much. Wrap them separately in shoe bags or even plastic bags and put them in separate parts. Stuff one in one side of the suitcase and one in the other.Or even in separate bags – whatever saves more space! Seriously- this helps. Do you REALLY want to carry your 1 kilo boots and half a kilo jeans and jacket with you? Apart from the weight – these things take up a lot of volume. Layer up and wear the heaviest ones you can. It’s just for while in transit right? Most airports, trains and buses are air- conditioned anyway, it is unlikely that you will feel too much discomfort. It saves space. Simple enough. We all dread long flights and train rides with nothing to do to pass the time. We end up buying a book at the station/airport lounge which we rarely read and then need to keep with us throughout the trip. Save yourself the hassle and pre download 4-5 e-books instead on your phone or ipad. You will have more reading variety, and not need to carry it everywhere. 9) Hair dryers and straighteners – do you REALLY need them? Do you really? They take up SO much space – not to mention they are heavy. Even the small travel sized ones. Most hotels will already have a hair dryer in their bathrooms and if they don’t you can always ask for one. If that doesn’t work out just go to a near by salon and get your hair done there. Unless you are London or somewhere in Europe where these services tend to be expensive, they won’t cost a lot more than what they do back home – I got my hair done all the time in Thailand and it was the most convenient thing ever. Paying for it is still worth the space you save carrying electronic items around. Well there you go. Those were some of the things I have learnt while packing suitcases. Hope these help. Happy Travelling!